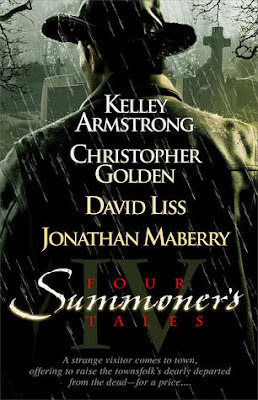 Four Summoner's Tales features the work of Kelley Armstrong, Christopher Golden, David Liss, and Jonathan Maberry. It's available at Amazon, Barnes and Noble, and BooksAMillion. In “Alive Day” by Jonathan Maberry, a US Army sergeant must dive into the underworld of modern-day Afghanistan to try and barter for the release of his team, never dreaming of the horrors that await him.. I received a free copy of this book from Net Galley in exchange for a review - it was Armstrong and Maberry that tempted me into requesting this book so I was surprised when I had trouble getting into Maberry's story, Alive Day, which is based on a series featuring his character Captain Joe Ledger. I've stumbled across a few of Maberry's short stories and have enjoyed them; I was excited for the opportunity to be introduced to this series, which turned out to be very militaristic - a paranormal government/spy thriller. The story was well-written but it's not my usual cup of tea. I enjoyed the motivation behind this book - that each author was given one premise that births four very different stories. I'd like to see more collections of this nature.